I’m speechless. I love the striped wool. I am going to have to take a second look at this coat pattern. Thank you so very much, Meris! You’re too kind! 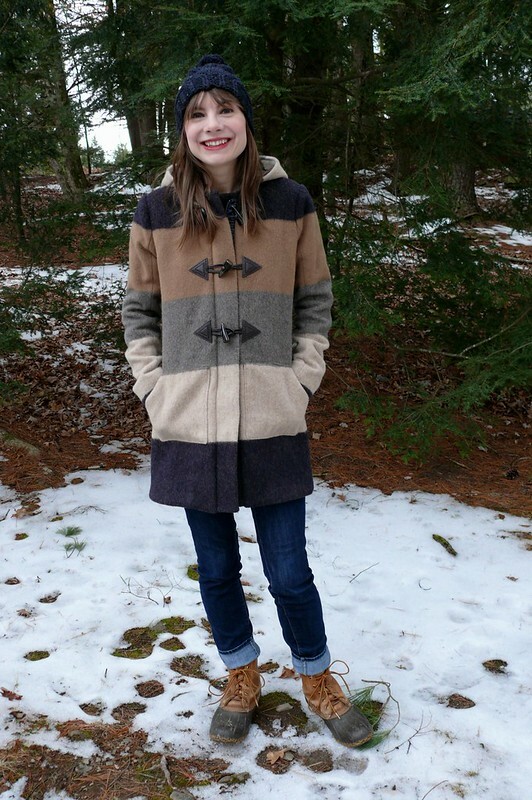 I really enjoyed making this coat- you should give it a try! ZOMG- this is awesome!! I love your fabric choice and modified pockets (so much more user friendly, those pockets)!! Thank you, Meg! Regular patch pockets are so cute, but if you’re a hoarder like me and you carry tons of crap around with you, they’re not quite as functional! Your coat is a tour of the garment district…you bought something for it from almost everywhere…at least all of my favorite stops. This is a stunning coat because of the fabric you bought for the shell. The toggles are perfect too. Just a fabulous coat, perfect for you and this weather! It really is, isn’t it? We’re so lucky to have access to so many great shops! I’m crossing my fingers that all of these stay in business for a very long time! Sometimes it’s kind of awesome to have a delay in a project like that after you’ve cut everything out – it’s so nice when you pick it back up that you don’t have to do that part! this coat was worth the wait! Oh this is so good! 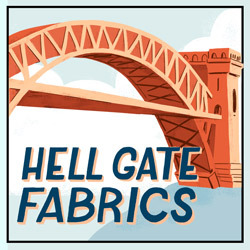 What amazing fabric – you’ve absolutely done it justice. And it sounds deliciously warm. Gorgeous. i really love your coat! the colors and the style suits you so well. it looks cosy and warm. nice that you took your time and finished the lining and the hem by hand. this extra efforts are so worth it! stunning! Love your version. The fabric is just fab and it sounds so warm. Amazing coat, love the fabrics and cool pockets. My perfect coat!! Beautiful coat! Pattern matching excellence. I probably should have done some shoulder pads, or at least sleeve heads. I don’t know why, but that didn’t occur to me until you mentioned it- good thinking! I think I will add a snap to the bottom of the placket, too. It will look tidier, right? Enjoy the rest of your trip and please stay warm!!! this is gorgeous! – I am saving your post to help me when I make this for my daughter. Ooh, happy sewing! I bet you’ll have fun making this! Looks amazing! 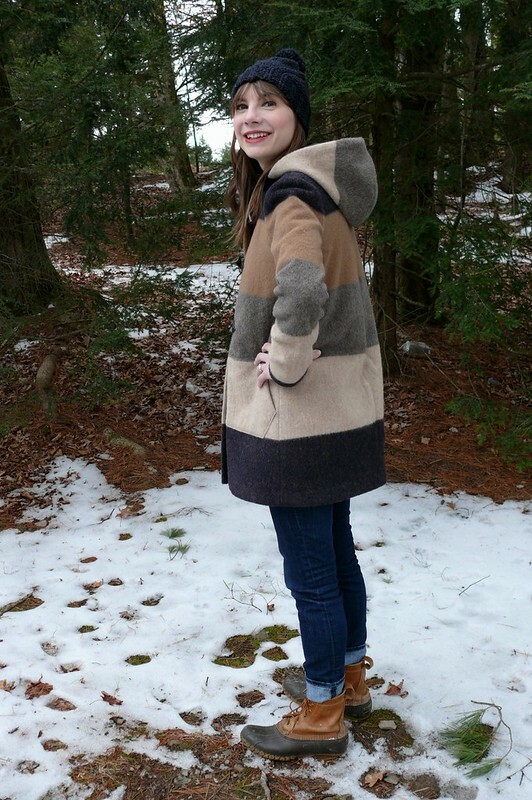 I finished my grainline cascade duffle coat last year after a year of procrastinating! I am so pleased to have made my own coat and the best coat I’ve owned. 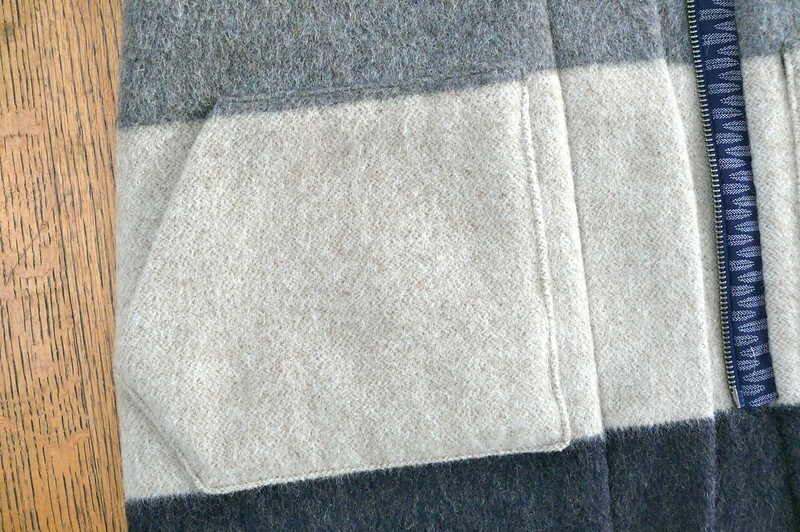 I interlined mine with a single wool fleece layer and also wouldn’t want to take close up photos of the toggles!!! Well done on finishing your beautiful coat. I’m glad I’m not the only one that procrastinated! It was sort of intimidating, wasn’t it, with the pages and pages of instructions? But it really was fun to make! So beautiful! I loved hearing about all the details. I just bought a jacket pattern and have been looking at all sorts of makes online. Your fabric choice was so inspired. I would never have thought to choose wide stripes and it looks so striking! Thank you so much! Have a great time sewing your jacket- it’s so rewarding to make something that you can wear over and over and over! WOW! I love everything about this coat, and those pockets are genuis! I have spatial problems, and I would never have figured that out. It seems the perfect coat. I am green with envy. I envy your coat … really! it’s perfect … now I’m going to dream about it too! Thank you, Sasha! Sweet dreams! 😉 Teeheehee! I just love your coat. When I first saw the pic of it coming through on Bloglovin’ I thought, “Did she sew all these fabrics together first (colour blocking) then cut out the coat? ?” I just had to investigate 🙂 I love this fabric especially on this coat. It’s so perfect! I love everything about it – the colour, shape, pockets, zipper. I’m not surprised you’ve worn it nonstop. I haven’t made a coat. That still feels above my sewing grade 🙂 but I have been looking at this pattern as well as the similar one by Closet Files. Woooooh…. color blocking by hand? I’m too lazy for that, but that’s actually a great idea if you can’t find a stripe you like! You could totally make a coat! I love the look of the CCF coat, too. I would love to make that, too! 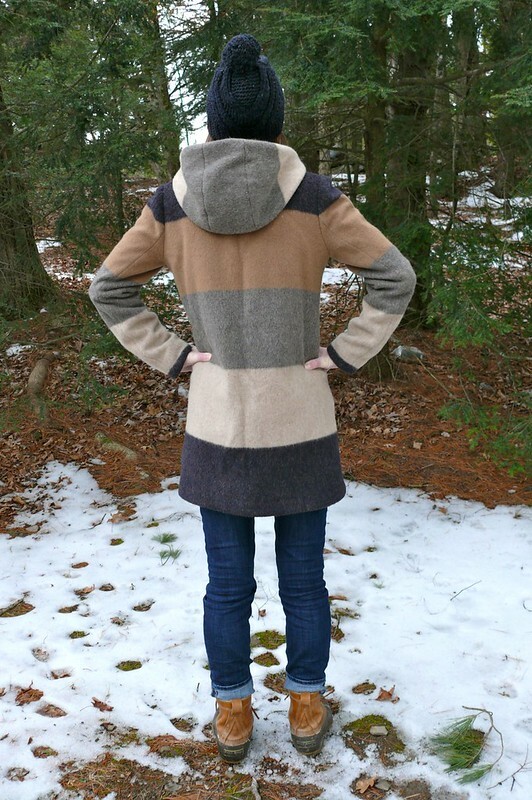 Lovely coat – I think the pocket details are so good. Wow that’s fantastic! 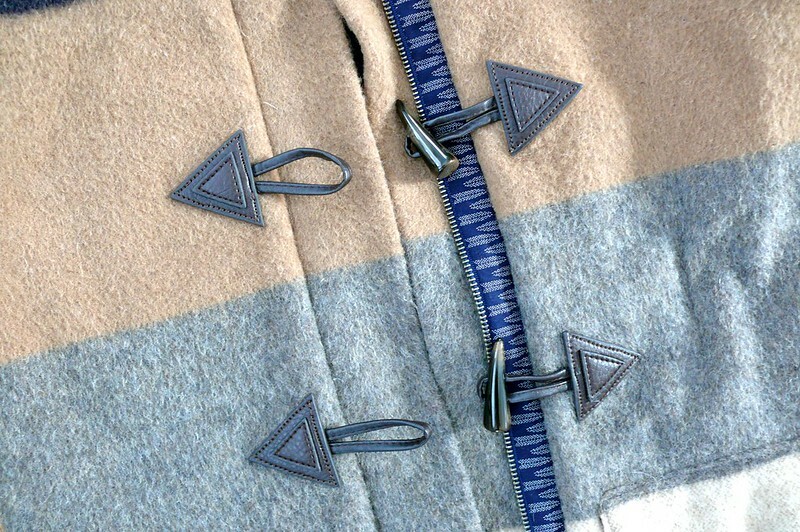 The fabric is perfect it is very interesting to read all your mods that make the coat for your needs. The pockets are very clever. Well done! I have only made one coat, the Sewaholic Minoru, which I really enjoyed making – I can see how you can get sucked into making more! Ooh, that Minoru seemed so fun to sew, with the zippered hood and everything! It’s just so rewarding to sew coats! That is fantastic !!!! what a perfect use for that fabric, looks like something you might see on the street in Italy (those very fashionable folks have great outerwear). Love the stripe placement. Worth putting in the time because you will wear it for ages. Ooh, now I want to go to Italy even more than I already did! Thank you so much, Beth! I love the mods you made & it looks great with the striped fabric! 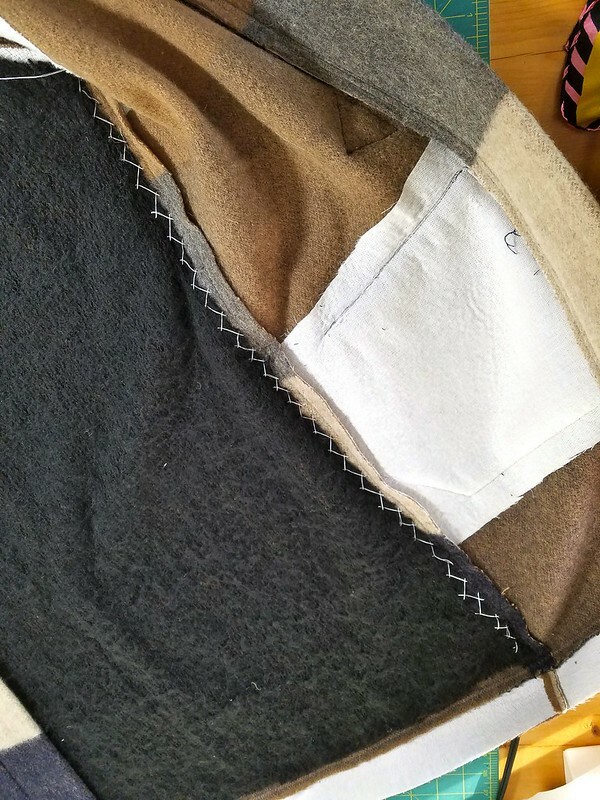 Coincidentally I’m also making a jacket which has taken about a year at this point, with several breaks, some for the weather and some because I just needed some time to figure out what the heck was wrong with it/couldn’t look at it anymore! But I think that’s healthy, sewing supposed to be fun, right? So if something is making me crazy I can just put it aside for a while … I do think mine will get done in the end too. Keep your chin up! Making definitely helps, and being kind to people, and taking breaks from the news. I totally agree- if something is joyless, why force it? Come back when it feels right! I know you’ll finish it one day! I’m trying to strike a balance between staying informed and getting overloaded… tricky these days, isn’t it? Thank you, Heather! Good luck and happy coat sewing- you can do it! Give it a try! Thank you, darling! I really am so glad to have this and I’ll really be taking good care of it to make it last forever! Oh wow this is such a gorgeous coat!! I love that fabric and thanks for such a great review. I’ll be bookmarking this for future reference, especially the lining tips! That fabric is amazing with that pattern! And the stripe matching is spot on. Great work! I’m keeping things simple right now for obvious reasons, but am hoping to tackle a midweight coat later in the year. And I picked up the cutest kids coat pattern, but we’ll see when I get to that one. Incredible use of such a distinct fabric! And I’m going to have to buy a copy of the Margolis book at some point. I bet you’ll like it! 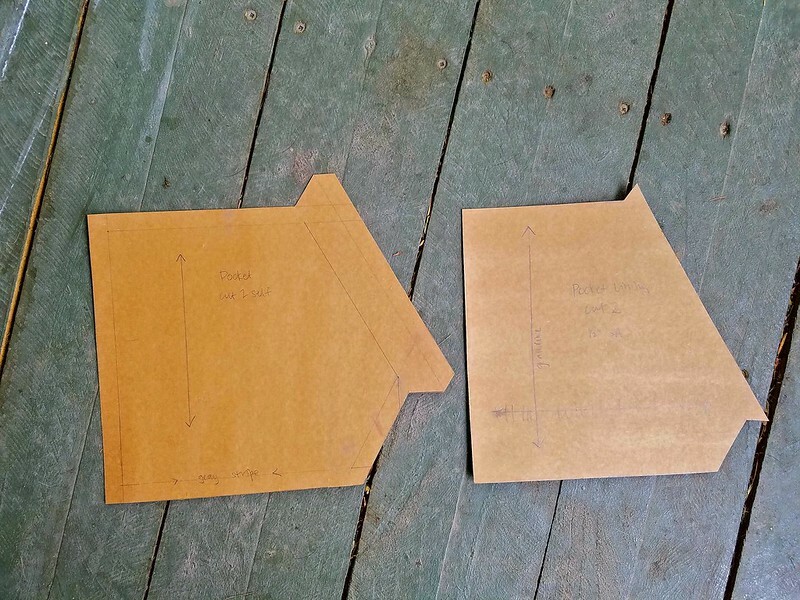 I also love her “How to Make Clothes that Fit and Flatter”- I forget if you have that or not! I like that she always seems to present multiple solutions for problems. It’s nice to be able to choose how best to solve a problem! Fabulous coat. You’re going to wear it to death. I’ve used felt to muslin a coat and just picked up a throw blanket (for $3.99) at Ikea for the next one. Ooh, that’s so clever! And much cheaper than anything else I can think of to sew with! Ooo!! Your coat is brilliant, and I love reading all the construction deets. I’ve just finished making a winter coat, so am coats on the brain at the minute. Now I want to make all the coats!! Your coat turned out so beautifully! 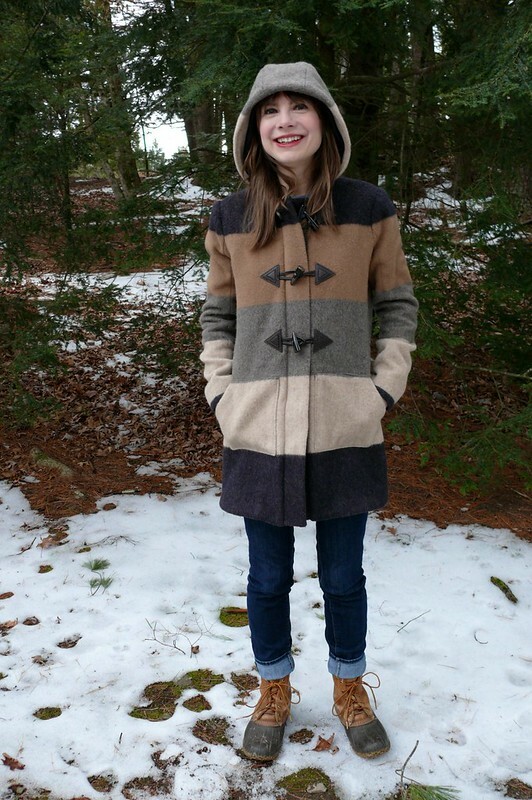 Coats really are such fun to make!! OOH! What a fabulous coat – that fabric really makes it something special! 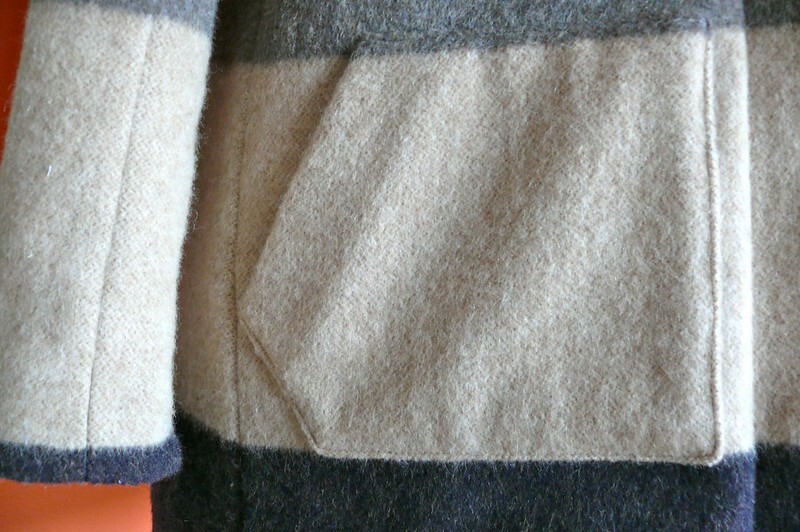 Love the peep into the insides… and those pockets being all matchy! Love it. Thank you, Mel! I’m so excited by the snippets of your jacket project that you’ve posted on Instagram. It’s seriously inspiring! Oh this is gorgeous, I love the bands of colour and the pattern matching on the sleeves is ace. I didn’t realise you could use sunback for lining, I thought it was just used for waistcoats. I want to make a coat now but my Gerard is still going strong, which I guess is a good thing! Haha! You’ve done too good of a job with your coat and now you can’t make another?! 😀 I’ve never heard of sunback for waistcoats, but that makes perfect sense! It’s much more durable than regular lining fabric… I’ll have to keep that in mind next time I make one! Your coat is so amazing! I’m also glad you waited to use this fabric on this pattern as its a match made in heaven. 😀 And yes on those pockets! lol I love that you converted them to side pockets while still being a patch pocket style. I ADORE this Sonja! That wool gets all the heart eye emojis from me!!! You’ve done such a beautiful job with all the stripe matching and details too. What a coat to own! 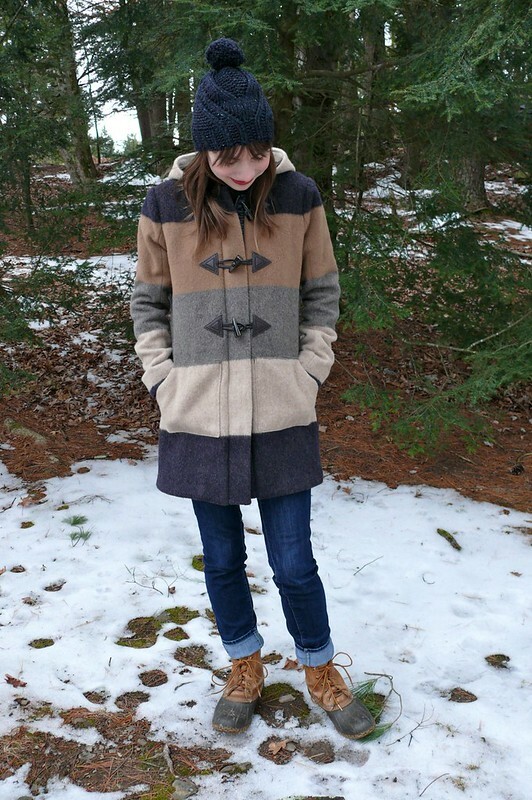 Um… this just rocketed to the top of my “favorite handmade coats ever” list. LOVE it! I would have been totally stumped by the striped fabric, but you worked it perfectly. I too bought this pattern the second it was released, but have yet to make it… Ugh! One of these days!!! Oh my! This is just perfection. I love the colours and the fit and construction are spot on! Totally in awe of your skills. This coat is amazing! I absolutely love the colours and also its style, perfect for the first autumn chill air! It gives you the desire of woods, hot tea and a bonfire!